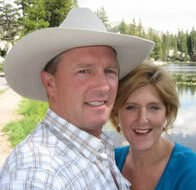 Tesla Ranch is run by the McPeek family--Mike, Debbie, Miles, and Maggie Rae--since 1997. This is a working cattle ranch, and we just recently added the facilities for horse boarding and riding. Come grow with us!